Have you ever wondered, “can I make money online for free?” While you won’t get rich or it won’t happen overnight, you are going to learn how to make money online without paying anything. Plus, I’ll share one of my favorite way to make money working from home. A side hustle is nothing more than doing something on the side to earn extra income. Some people start side hustles in hopes of leaving their 9-5, while others just want to supplement their income. The great thing is that you have the potential to earn as little or as much as you want. It all depends on how much effort you want to dedicate to it. It’s totally different than a side job, where someone sets your hours and wages. A side hustle is flexible and you work it on your terms. If you spend time online reading income reports or just browsing, you’ll realize that a lot of people are opting to earn money working from home. Anyone who has access to a computer or the Internet can get started. The great thing is that there are several ways beginners can get started for free. I don’t know about you, but I got tired of working for someone else that called all the shots. Around 2009 I decided to find different ways to make money from home. (some worked and some didn’t work very well) Today, I am working as a WordPress freelancer and working hard on growing this blog into a full-time business. I’m no smarter than anyone else. I just knew that I wanted more control over my financial situation and I made the decision to get started. You don’t have to quit your full-time job as I did. Just get started with the free time you have. Once you start earning, you’ll be hooked and you’ll want to break the chains from your day job. I’ll be sharing some different ways that you can start earning money from home. A majority of the methods will require no investment whatsoever, except your time. Are you ready to start your side hustle today? This is my favorite way to make money because you can start a blog in basically any niche and with persistence and time you can grow your income. You can start for free on a platform like Blogger or WordPres.com. However, I highly recommend getting started on a self-hosted WordPress blog. It’s not as expensive as expensive as you might think. I’ve created a step by step tutorial on how to start a WordPress blog that will help you get up and running in 5 minutes. It’s easy you can start today and be up and running in minutes. All you have to do is decide if you want to use a free platform or start with a self-hosted blog. If you’re testing the waters and not sure if you’ll enjoy it, I’d recommend starting on a free platform. Once you realize that you’re ready to start building a profitable business, you can migrate to a self-hosted blog. This isn’t a fast way to earn money online. It’s going to require a lot of hard work to turn your blog into a profitable venture. However, there are so many people who started from scratch and have been able to earn money from home. One of the great things about blogging that I love is that there are so many different ways to earn. You can make money through affiliate programs, ebooks, online courses, sponsored posts, advertising, displaying ads and etc. Virtually the sky is the limit and there’s no cap on the amount you can make. Of course, you shouldn’t expect to start a blog today and start earning tomorrow. But if you’re willing to keep at it and keep learning, you can grow your blog and eventually earn a great income from home. Here’s a look at some income reports from bloggers who have managed to turn their blog into a profitable venture. Blogging does come with a learning curve, if you want to cut your learning curve in half, I recommend you invest in a good beginning bloggers course that will teach you the basics. You won’t believe how much time you can cut down on your learning curve by investing in a course. Do you like being on camera and have the gift of gab? If so, you can always start a YouTube channel and monetize it with ads. You won’t make money overnight, but as I mentioned, none of the methods that I share with you are going to make you rich overnight. Starting a YouTube channel is one of the slower methods of earning profits from home. However, it can be extremely lucrative that can eventually lead to sponsorships and more ways to monetize than ads. I’d suggest taking some time to browse some popular YouTube channels to find out what they do to grow their audience. This will give you an idea of what type of videos you need to create to start getting people’s attention. You won’t be able to buy a fancy microphone like the Yeti or other recording equipment. However, if you have a smartphone with a good camera, you’ll be able to take some decent videos. They won’t be the best videos, but if you can create good videos that capture people’s attention, you should be able to grow your following. The downside is that you won’t be able to monetize your ads until your channel receives at least 10,000 views. So you’ll want to make sure that you tell everyone you know to share it and start finding ways to share it as well. Most people who want to start an online venture always want to know if it can be profitable. They usually want to see some type of stats or hear about people who have had success. I’ve personally never understood this. Just because someone else has made a lot of money in an online venture, doesn’t necessarily mean you will. It just means that it’s been proven that it’s possible. Anyway, here are some amazing YouTube stars that have become millionaires over time by uploading their videos and growing their fan base. There are thousands of people who are choosing the Internet lifestyle instead of working the traditional 9-5. This opens up an endless opportunity for anyone who wants to work from home as a virtual assistant. A virtual assistant is someone who gets paid to do specific tasks, such as; edit content, create pins for Pinterest, upload pins to Pinterest, schedule social media posts, booking appointments with clients, setting up autoresponders and etc. There is an unlimited number of things that you can do as a virtual assistant. The great thing is that even if you don’t have a lot of technical skills, you can still find the right virtual assistant side gig. Read everything that you can about becoming a virtual assistant. There is a ton of information available for free that you can devour and learn from. Here’s a great blog post that will teach you everything you need to know about becoming a virtual assistant. Join some Facebook groups that are dedicated to helping you get started in the virtual assistant fields. Here’s a list of 15 virtual assistant Facebook Groups to get started with. I’ve also seen some people join Facebook groups and offer their services for free to a few people. This helps them get testimonials and makes it a lot easier to find people who are willing to pay them for their services. You will need to work hard on getting your name out there. Once you decide that you want to do this, you’ll want to tell everyone that you know about your services and your pay rate. I’d recommend ordering some free business cards and hand them out wherever you go. It’s not easy getting your first virtual assistant side gig, but once you get your first one, the others should come easier. Now let’s take a look at some people who decided to become virtual assistants and share their success with you. Here is a great article about three virtual assistants who now make six figures. You might have read stories about people who got started as freelance writers? I currently work from home as a WordPress freelancer. If you have a skill that you can offer people, this can be a legit way to make money online. There are plenty of sites that you can use to get started as a freelancer. When I was trying to become a freelancer, I signed up with Upwork to find my first gig. The downside to using a site like that is there are tons of other freelancers who are bidding on the same job you’re doing. You’ll quickly learn that a lot of people tend to choose the ones that bid the lowest. So it’s going to be a challenge to find a freelance side gig that actually pays decently. Don’t give up, I managed to find a few decent paying ones when I was using that site. Getting your name out there on your own can be a challenge. I’d recommend signing up for some of the freelancing sites to see if you can land your first gig. At the same time, I’d join some Facebook groups dedicated to freelancers to see what other people are doing to get their name out there, here are some that you can check out. This venture will only be as profitable as you make it. It’s going to require a lot of legwork to get your name out there and start offering your services. Here are 7 successful entrepreneurs who began as freelancers. While you won’t get rich by filling out online surveys, you can use it to supplement your income. Wouldn’t it be great if you could make enough money to pay your grocery bill for the month? Well, you can and Swagbucks is a legitimate company to get started with. They are a portal that rewards points for doing simple tasks online like watching videos, searching the web and filling out online surveys. You get paid in Swagbucks points, which can be converted into gift cards or cash. Don’t expect this to be a very profitable venture, but you can earn some decent money on the side. It’s not hard to get started, all you need to do is create a free account here. (you’ll get a $5 bonus just for signing up) You can earn right away, just by completing your profile, and installing the SwagButton browser extension (which helps you find cashback opportunities when you’re shopping online.) and making SwagBucks your default search engine browser. Once you’re set up, you can start earning SBs (SwagBucks). Each SB is worth one cent. There are various ways you can start racking up SBs. As I mentioned, you won’t get rich just by filling out surveys online. However, if you make it a point to complete surveys on a regular basis, there’s no reason why you can’t turn it into a decent side gig. Here’s a motivating story about someone who makes $1205 per year just by using SwagBucks. This will give you an idea of what it actually takes to start earning with Swagbucks. This list could go on and on. What I’m trying to tell you, is that there are tons of different ways to earn from your computer and your Internet. I’d recommend picking 1-2 methods to get started with. The main reason that so many people fail to make money online is that they pick one method and they don’t see results quickly, they move on to something else. Be realistic about the amount of money you can earn. If you’re completing surveys, you can expect to make as much as a blogger does. 2018 is coming to an end and there’s no better time than now to get started in an online venture. There are tons of opportunities that you can choose from. It’s just up to you if you which one you want to start with to start the New Year with a bang. You never know what life will look like at the end of 2019 if you don’t get started. You’re the only one who can change your financial destiny and it’s not going to change if you don’t do something differently. If I was starting over and I wanted to earn from home, I’d choose to blog. I enjoy writing and there are several different ways you can monetize your blog. Have you been searching for a way to earn money from home? If so why haven’t you gotten started? Hey Buddy!, I found this information for you: "How to Make Money Online Without Paying Anything". 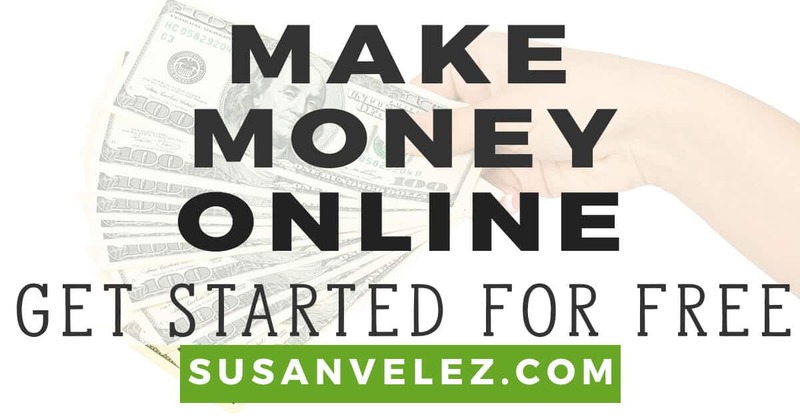 Here is the website link: https://susanvelez.com/how-to-make-money-online-without-paying-anything/. Thank you.